Got a question about your vaporizer that you've been too embarrassed to ask around your e-smoking posse? Or are you a new e-smoker looking for some answers? Either way, you've come to the right place. Each and every day, our VAPETENDERS® get asked a myriad of questions—everything from what a vaporizer is, to troubleshooting a malfunctioning device. Keep scrolling down to read our responses to these and other common questions people have about e-smoking. A vaporizer is a type of electronic smoking device that, like the basic e-cigarette you see in convenience stores and gas stations, delivers inhalable doses of flavored nicotine by heating up e-liquid. Unlike tobacco cigarettes, vaporizers and e-cigarettes emit no smoke, no odor, and no tar. Vaporizer cigarettes differ from the standard e-cigarette in that they resemble tobacco cigarettes less, have a longer battery life, can hold more e-liquid at one time, and come with a wider range of customization options that are geared towards the more advanced e-smoker. Those are just a few of the differences between e-cigarettes and vaporizers. Is e-smoking cheaper than regular smoking? The upfront costs of e-smoking are higher than regular smoking. In addition to the electronic device itself, there are several other parts you need if you want to build-up your e-smoking stash from scratch. These expenses include: extra e-liquid, charging plugs, backup batteries, and any accessories you may want. In the long run, however, many e-smokers end up saving money. Vaporizer batteries that are properly cared for can have a lifespan of several months, which helps users get the most bang for their buck. And by following some simple money-saving tips, you can increase your battery life even more. Does using a vaporizer feel the same as smoking cigarettes? Yes and no. While using a vaporizer is essentially the same idea—you inhale the nicotine through your mouth—there are also some key differences in how you use it. For one, puffing on a vaporizer is much different than taking a drag on a cigarette. Click here to learn how. Manufacturers of vaporizers often boast that one of the many benefits of e-smoking is having the freedom to use them anywhere since vaporizers don't emit secondhand smoke and are not included in many smoking bans. While this is mostly true, there are a few places still where e-smoking is not allowed (i.e. on airplanes, at workplaces and restaurants, and in a handful of countries and U.S. cities). Also, a quick sidenote: Just because you can whip out your vaporizer in public doesn't mean you always should. Certain situations, like in a movie theater or at your child's school, are probably not the best place to start carelessly puffing away, since doing so would make a scene. Use discretion when turning on your vaporizer in public and be conscious of basic e-smoking etiquette. How do I refill my vaporizer tank? It's easy! (For our vaporizers, anyways.) Check out our how-to videos to see how simple it is to refill your VaporFi device with e-liquid. The PG/VG proportion is responsible for the throat hit and vapor production. Here at VaporFi, we carry a 70/30 PG/VG blend, because we've found that particular ratio provides the best mix of both worlds. What the heck is variable voltage/wattage? Simply put, variable voltage/wattage is an advanced technique that allows users to manually adjust the heat of their atomizer. When done right, this process improves the overall quality of the e-smoking experience by bringing out the strengths of certain flavors when vaporized at various temperatures. However, the use of variable voltage/wattage vaporizers requires a thorough knowledge of amps, watts and resistance levels – otherwise you risk accidentally burning out the heating coil or frying the e-liquid. You will definitely want to learn about how variable voltage/wattage works before you attempt it on your own. What's wrong with my vaporizer? Got a leak? Vaporizer not working? Watch this instructional video if you need to troubleshoot your device and figure out how to fix it. If you have another question about your vaporizer or e-smoking in general that wasn't answered above, one of our friendly customer service professionals would be happy to help you. 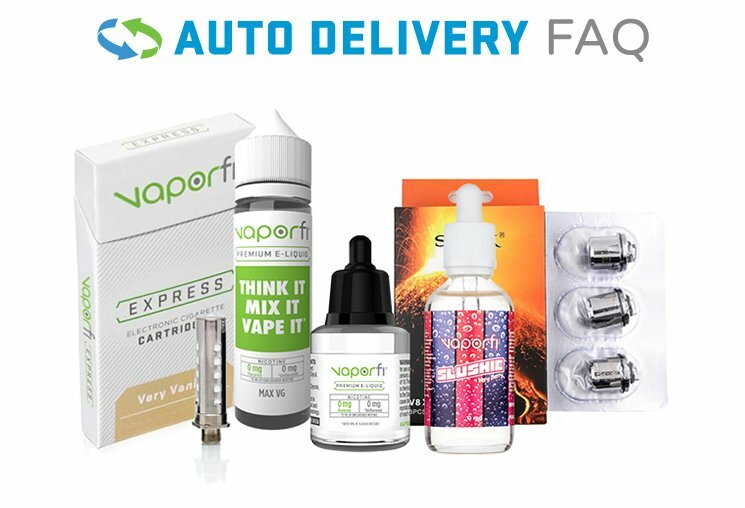 You can also browse through our FAQ section other commonly asked questions about VaporFi products, or visit our Learning Center to continue your e-smoking education.